The multicultural Cluj-Napoca is the capital of the historic region of Transylvania. Satisfy your inner culture vulture at Museum of Art and St. Michael's Church. Give yourself a bit of retail therapy at Oranjerie and Iulius Mall Cluj. Venture out of the city with trips to Ramet Gorge (in Baia de Aries), Moara de Vant (in Ciurila) and Sic Calvinist Reformed Church (in Sic). Spend the 12th (Tue) exploring nature at National Ethnographic Park. Next up on the itinerary: identify plant and animal life at Cheile Turzii - Turda Gorge, take in nature's colorful creations at Botanical Garden, buy something for everyone on your list at VIVO Cluj Napoca, and contemplate in the serene atmosphere at Reformed Church of Cluj-Napoca. To find ratings, maps, more things to do, and tourist information, read our Cluj-Napoca online driving holiday planner . Tel Aviv, Israel to Cluj-Napoca is an approximately 5.5-hour flight. Plan for cooler temperatures traveling from Tel Aviv in February, with highs in Cluj-Napoca at 7°C and lows at -1°C. Wrap up your sightseeing on the 14th (Thu) to allow time to take a train to Oradea. Oradea the capital city of Bihor County and Crișana region, is one of the important centers of economic, social and cultural development in the western part of Romania, retaining these characteristics throughout history. Head to Darvas- La Roche House and Lotus Centerfor some retail therapy. Oradea Fortress and The Roman-Catholic Cathedral are good opportunities to explore the local culture. Next up on the itinerary: relax and rejuvenate at some of the top local wellness centers, go for a walk through Ciuperca Hill, contemplate in the serene atmosphere at The Holy Cross Monastery, and stroll through Lacul cu nufer. To find more things to do, reviews, where to stay, and tourist information, read our Oradea trip planner. You can take a train from Cluj-Napoca to Oradea in 3 hours. Alternatively, you can drive; or take a bus. In February, daytime highs in Oradea are 7°C, while nighttime lows are -1°C. Wrap up your sightseeing on the 18th (Mon) early enough to drive to Timisoara. Timișoara is the capital city of Timiș County, and the main social, economic and cultural centre in western Romania.The third most populous city in the country, with 319,279 inhabitants as of the 2011 census, Timișoara is the informal capital city of the historical region of Banat. 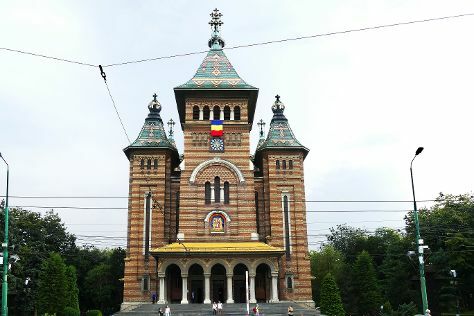 Timisoara Orthodox Cathedral and Memorialul Revolutiei are good opportunities to explore the local culture. Head to Iulius Mall and Calina Art Galleryfor some retail therapy. Explore the numerous day-trip ideas around Timisoara: Arad (St. Anthony of Padua Church, Holy Trinity Cathedral, & more) and Dendrological Park (in Bazosu Nou). There's lots more to do: don't miss a visit to Piata Victoriei, browse the different shops at Shopping City Timisoara, look for gifts at La Cave a Vins, and pause for some photo ops at Piaţa Victoriei. For traveler tips, maps, ratings, and tourist information, go to the Timisoara travel route planner . You can drive from Oradea to Timisoara in 2.5 hours. Alternatively, you can take a train; or take a bus. In February, daily temperatures in Timisoara can reach 10°C, while at night they dip to 0°C. Cap off your sightseeing on the 23rd (Sat) early enough to travel to Deva. Deva is a city in Romania, in the historical region of Transylvania, on the left bank of the Mureș River. Do some cultural sightseeing at Castelul Corvinilor and Expozitie Inedita: Ev Mediu. Tortura Si Executie. Get out of town with these interesting Deva side-trips: The Gold Museum (in Brad), Bears' Cave (in Chiscau) and Padis (Fortress of Ponor & Galbena Gorges). There's lots more to do: identify plant and animal life at Arboretumul Simeria, contemplate in the serene atmosphere at Densus Church, make a trip to House of Volcanoes, and buy something for everyone on your list at Shopping City Deva. To find traveler tips, maps, ratings, and tourist information, go to the Deva online travel route planner . You can drive from Timisoara to Deva in 2.5 hours. Expect a daytime high around 10°C in February, and nighttime lows around 1°C. Wrap up your sightseeing on the 27th (Wed) to allow time to travel to Sibiu. Reminiscent of the height of the bourgeoisie and retaining much of its medieval architecture, Sibiu is Romania's cultural gem. Get some cultural insight at Framm's and Museikon. Explore the numerous day-trip ideas around Sibiu: Alba Iulia (St Michael's Roman Catholic Cathedral, Citadel of Alba Iulia, & more) and Rapa Rosie (in Sebes). There's much more to do: make a trip to Big Square (Piata Mare), take in the views from Bridge of Lies, take in the spiritual surroundings of Lutheran Evangelical Cathedral & Tower, and examine the collection at Brukenthal National Museum. For where to stay, photos, traveler tips, and other tourist information, read our Sibiu visit site . Traveling by car from Deva to Sibiu takes 1.5 hours. Traveling from Deva in February, Sibiu is a bit cooler at night with lows of -4°C. Finish up your sightseeing early on the 5th (Tue) so you can go by car to Sighisoara. As a World Heritage Site, Sighisoara is visited mostly for its fortified Old Town surrounded entirely by city walls. Get some cultural insight at Art & Crafts and Church on the Hill. Venture out of the city with trips to Izvoare (Icelandic Horses Riding Ranch & Ivo Wildlife Park) and Petry Museum and Workshop (in Tirgu Mures). 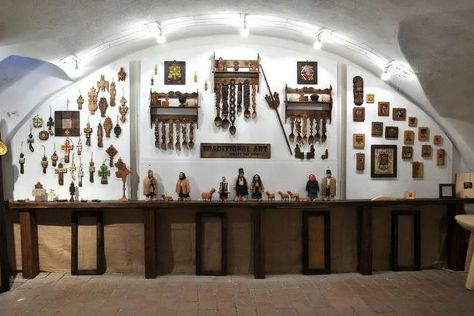 And it doesn't end there: get to know the fascinating history of Sighisoara Historic Center, look for all kinds of wild species at Breite Ancient Oak Tree Reserve, don't miss a visit to Clock Tower, and sample the fine beverages at Pivnita lui Teo - Teo's Cellar. To find maps, more things to do, photos, and more tourist information, you can read our Sighisoara sightseeing planner. Traveling by car from Sibiu to Sighisoara takes 2 hours. Alternatively, you can take a train. Expect a daytime high around 14°C in March, and nighttime lows around -1°C. Wrap up your sightseeing on the 8th (Fri) to allow time to drive to Brasov. With the dramatic Carpathian Mountains as backdrop, Brasov is the largest city in a region of mountain resorts. Head to La Cabane Aux Images and The Himalayan Boutiquefor some retail therapy. Do some cultural sightseeing at Brasov Historical Center and Natura in Bucate. Explore Brasov's surroundings by going to Bran Castle (Dracula's Castle) (in Bran) and La Prapastii Zarnesti (in Zarnesti). The adventure continues: take in the spiritual surroundings of Black Church (Biserica Neagra), make a trip to Council Square, appreciate the extensive heritage of Rope Street - Strada Sforii, and relax and rejuvenate at some of the top local wellness centers. To find photos, where to stay, ratings, and tourist information, refer to the Brasov vacation maker website . Traveling by car from Sighisoara to Brasov takes 2 hours. Alternatively, you can take a bus; or take a train. Finish your sightseeing early on the 14th (Thu) to allow enough time to travel back home.